Hotel staff was very friendly. 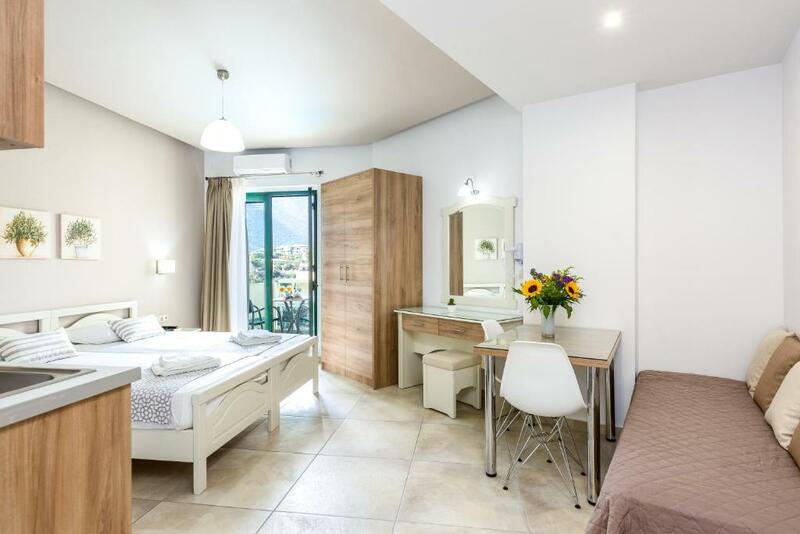 Hotel had a good price-quality ratio and it is within walking distance to several beaches. Views to the sea and mountains were great. Quiet at night. Nice apartment layout for a family. The staff were incredibly friendly and accommodating (even when we showed up a day early by accident). Very convenient. Only wish Greece did Hot tubs as well as pools! Would be nice after a day at the beach! Very centrally located without being right in the middle of all the tourism. Clean, attractive, easy! It was very close to the beach and an overall good location. Brand new looking room with astonishing view from the balcony. Very spacious and comfortable living. Adonis and his family are amazingly welcoming and have a great place. 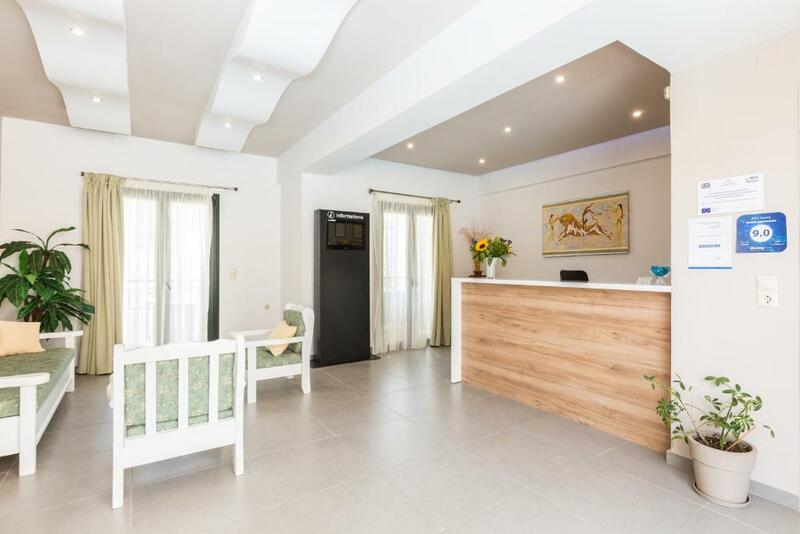 Located a quick walk from one of the main drags in town as well as the main tourist beach the apartments are conveniently located. Rooms were clean, exactly as advertised in the pictures, and the pool was well kept. The owner (Adonis and his wife Niki) know everyone in town and are both fluent English speakers. This is very helpful if you have questions about the local restaurants, rental car services, or excursions. We found the rates to be reasonable, by American pay standards at least. Easy to get to from Heraklion by the public bus or by taxi. Very good, clean ,good value and in a perfect location. The stuff was very friendly and the barman was really fun. The rooms also were very quiet and we didn't had any problem throughout our vacation. We arrived late for 1 night stay and the receptionist was very nice even giving us cold bottle of water each and helping getting the air con to come on. Bed was comfy enough. Simple room. Very spacious room and good bathroom. Staff were very helpful. Five beaches in close proximity and lots of places to eat nearby. The young waiter at the bar was friendly. The room was clean and sober. They give Nice shampoos. 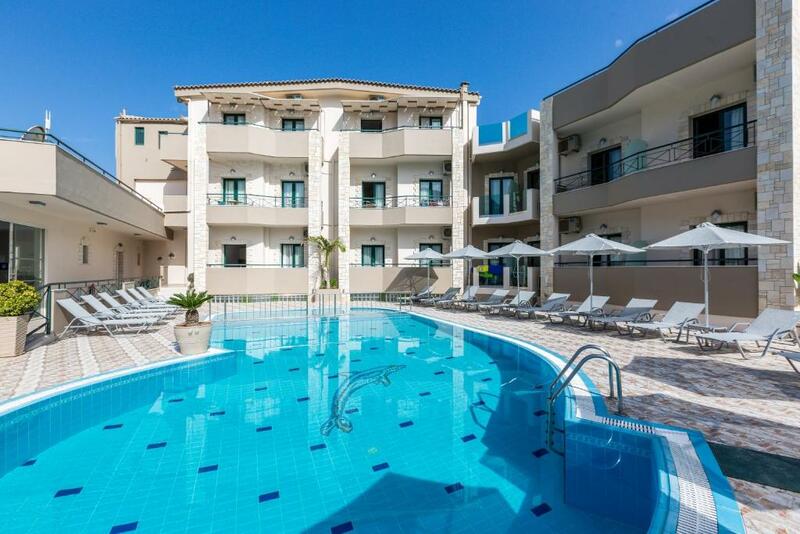 Lock in a great price for Amalia Apartments – rated 8.9 by recent guests! One of our top picks in Bali.Built on a hill with a panoramic view of the sea and the village, the family-run Amalia Apartments features 2 swimming pools and offers self-catered accommodations. The beach of Bali is just 150 feet away. Combining modern and traditional features, the spacious and bright studios and apartments come each with a patio or a balcony and free Wi-Fi. 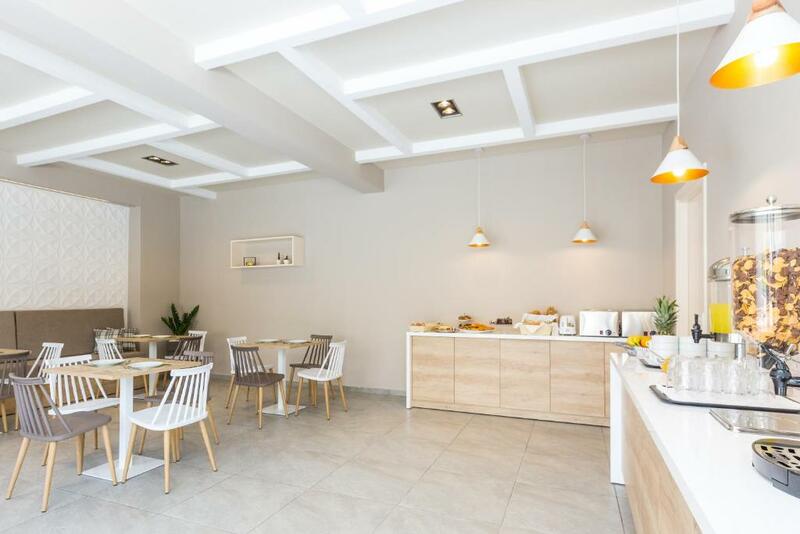 A kitchenette, seating area and dining area are included. Guests can relax on the poolside and enjoy the sun and the view over the sea. The pool snack bar serves a variety of drinks and light meals while it also features board games and a wide-screen TV. Food and drink are available at the seafront taverns and bars; the organized beach of Bali also features sun beds, umbrellas and water sports. Bali village lies 16 mi east of Rethymnon city and 31 mi west of Heraklion city. The scenic port is the ideal starting point for excursions and cruises to nearby beaches. Free parking is available on site. 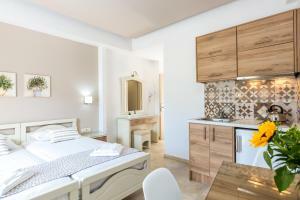 When would you like to stay at Amalia Apartments? Spacious and bright studios with a patio or a balcony and free Wi-Fi. 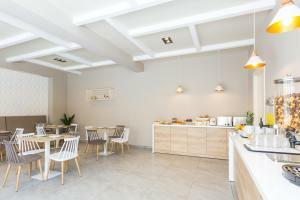 A kitchenette, seating area and dining area are included. Very spacious and bright apartment with a patio or a balcony, free Wi-Fi, a kitchenette, sitting area and dining area. This studio has a balcony, stovetop and soundproofing. 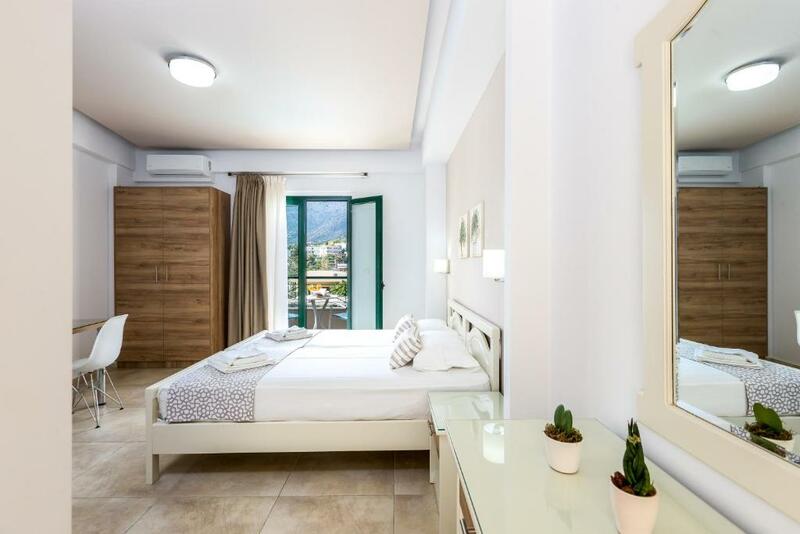 Amalia Apartments is a family business that accommodates consistently its customers for approximately 20 years, offering a cozy, friendly and hospitable environment, representing deservedly the well known Cretan hospitality. House Rules Amalia Apartments takes special requests – add in the next step! Amalia Apartments accepts these cards and reserves the right to temporarily hold an amount prior to arrival. Pool was not very clean, and also our room wasn't cleaned very thoroughly (dirty floors, bathroom and kitchen wasn't cleaned during our 10 days stay). Village isn't really a village at all, just few shops and hotels along the road, not very pleasant to walk around. The bin in the toilet had not been emptied and contained soiled sanitary products, poo paper etc. The bedside light on one side did not work and the glass shade was missing. Better food opportunities on-site. "Snack bar" next door seemed to be closed for the season so there was no on-site food. If you want a tourist fake city with mostly russians and germans.. well Bali is the Perfect spot for you. Zero charm. Zero authenticity. Zero Greece except for the sea. I am half greek and coming To this place broke my heart. 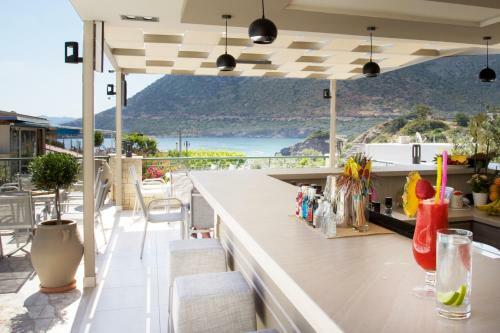 There are so many amazing places in Crete.. and Bali isnt one of them. The hotel was the most basic place ever seen. Nothing waw... just à loud swimming pool from early hours (kids screaming and splashing). The room was ok. A bit dark. There was a smell of toilet all over the place... probably the septic fosse underneath the hôtel... i hated the whole package but the hotel wasnt that bad.. just regular with a horrible village..i will never come back To Bali. Very clean, lovely pool that wasn’t crowded. Location is hilly but great restaurants and a few different beaches to explore. I stayed at the Amalia apartments for a week with my girlfriend. The hotel is clean and modern. Our room was large and spacious with a small but adequate balcony. The pool area is pleasant and clean with sunbeds. The staff are friendly and extremely helpful and the area is quiet at night. The hotel is perfectly located and is strolling distance to all of the resorts beaches, restaurants and bars. I would highly recommend staying at the Amalia Apartments. Nice place, close to the cozy beach with clear calm water. Light interior, small kitchen, nice balcony. Wifi in room. Shower was poor and bed not very comfortable. Wifi didn’t work. Room was dated compared to the photos. Only stayed one night didn’t use the facilities. Small very quite a friendly hotel , for sure we will visit them again. For sure families can visit them with children's and parents. The room was very good new and comfortable . The breakfast was very good . AC is just in the bedroom which leaves the other room and the kitchen quite hot. The apartments are super clean and modern, very nice pool where all children play together in harmoney, the staff is very helpful and friendly. Great vication atmosphere. The beds were a little hard and could have used more pillows, but found this to be typical of accommodations in Greece/islands-we stayed in 6 different places during our 3 week trip. Could have used a little more clothes storage for kids who slept in the living room (on the 2 twin beds), but that was a minor thing. The owners and staff were so nice! They're English was great (we speak no Greek), they were accommodating and were very knowledgeable about the area. Complex was very clean, view was pretty and we found the location to be very convenient.